In the last blog reference was made to another high tec tool, shown above. 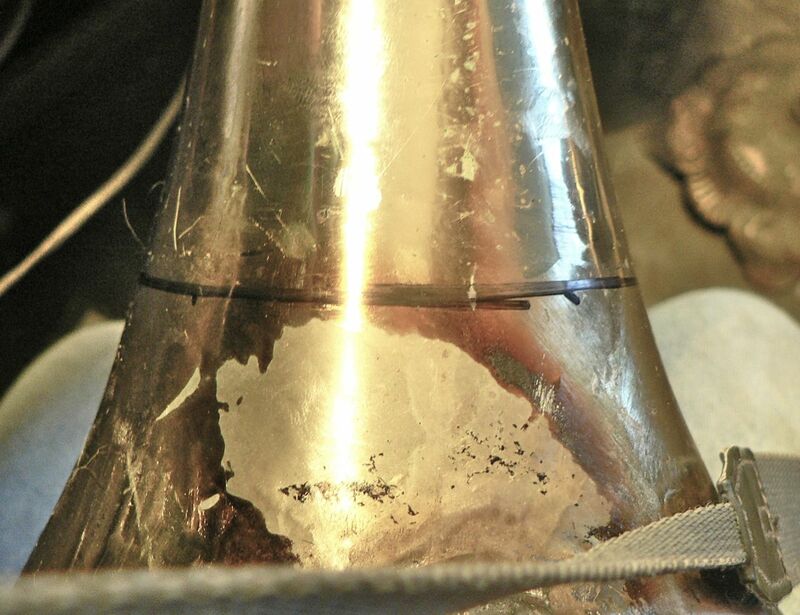 As mentioned when cutting a trashed bell the lower ringset will not set square to the bell rim. 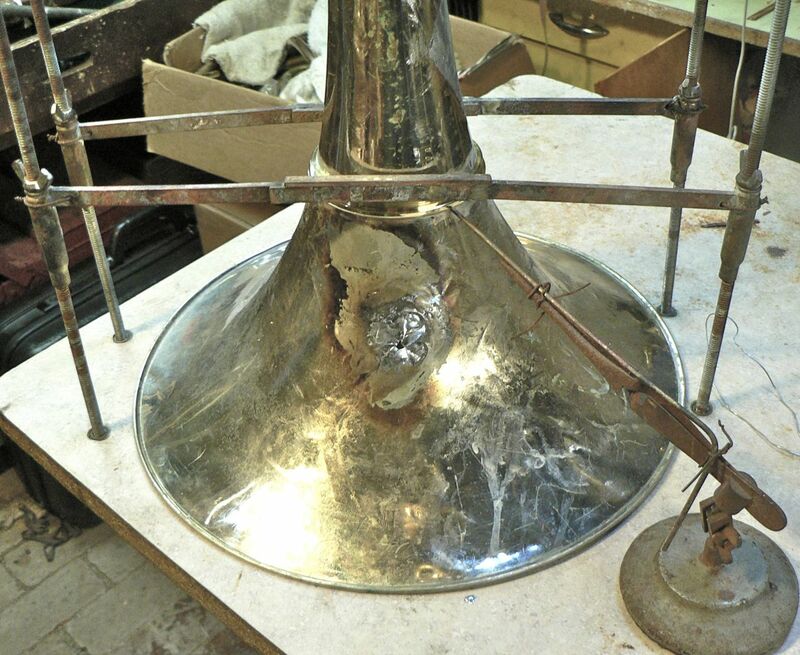 This why we spent some time straightening a bell that will not be used. This tail is not so bad, the flare is junk, but we’ve straightened it enough that the ring set can be attached securely enough to cut. I placed the ring on the tail and drew around with a sharpie. Then using nail files I remove the lacquer above the sharpie mark. 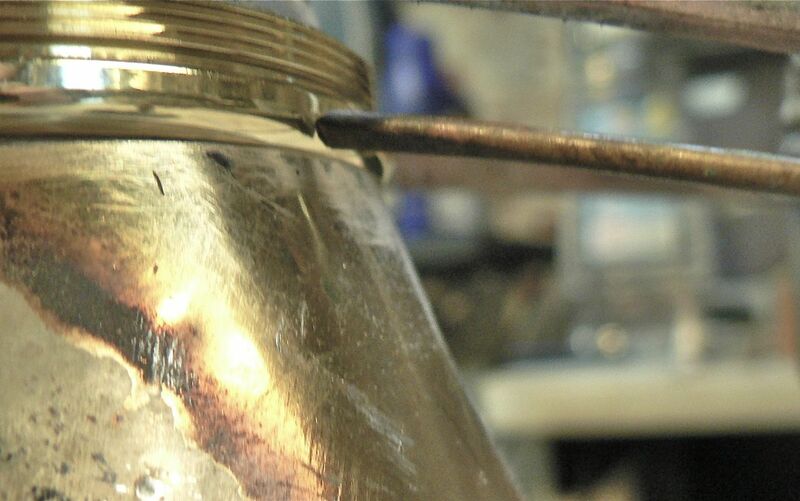 The solder will not take to the lacquered surface. 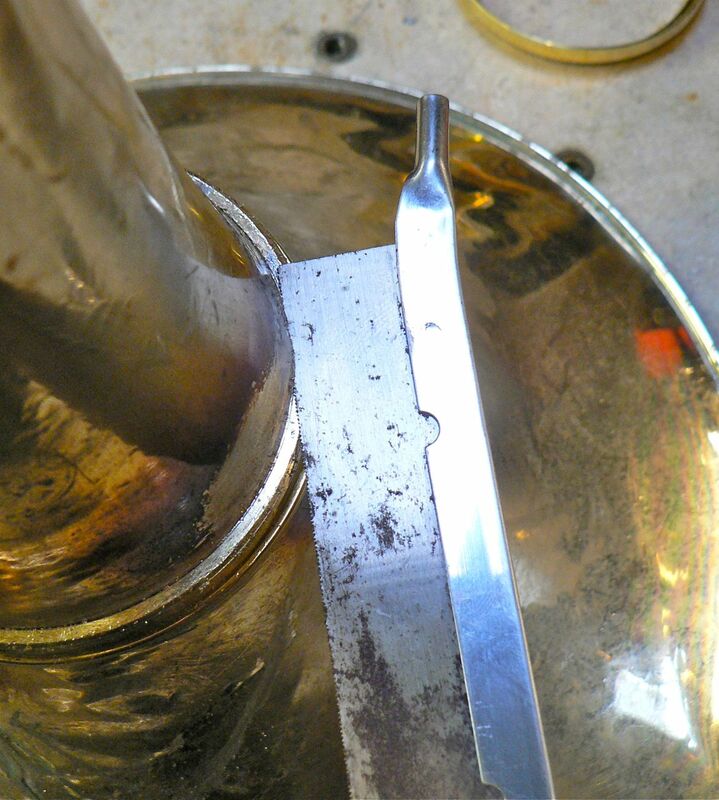 Ideally, the lacquer should be removed before the ring is soldered in place. The lacquer will harden near the areas heated. It is more difficult to strip, we discuss this in a future blog. So now it’s time to use two high tec tools. The top of the bottom ring set needs to be even with the bell rim. This flare will not be used. but the cut to the bottom of the bell tail also needs to be even with the new bell flare. 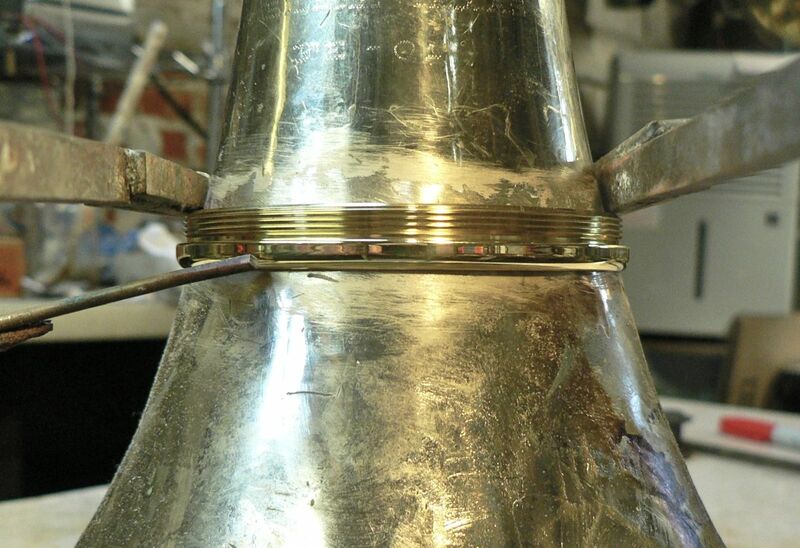 Using the odd little pointer, if triangulated around the ring will determine that the ring is parallel to the bell rim. Back to the high tec tools. 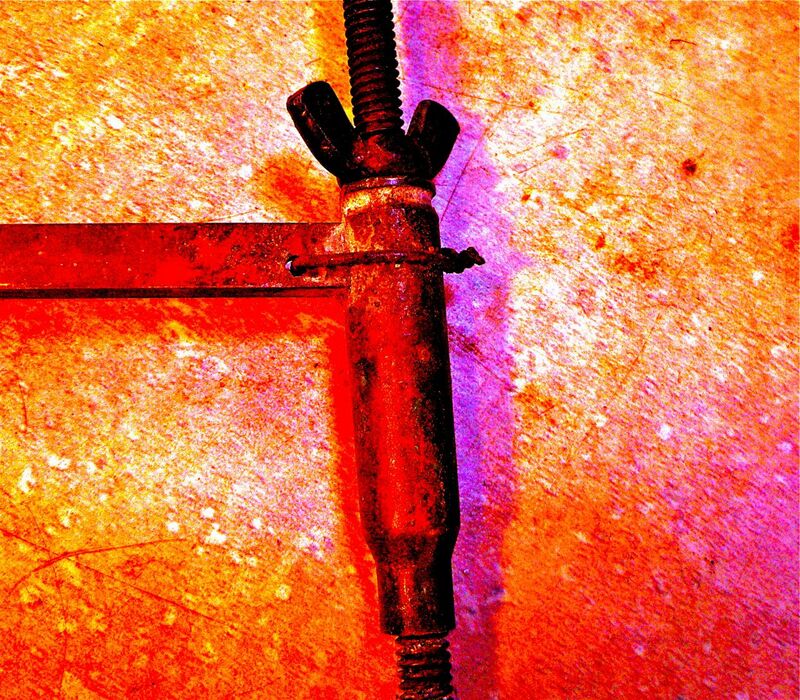 The well used apparatus which uses four pieces of threaded rod, wing nuts and bars made from brass rod, soldered to cartridges with the primer pockets drill out to allow the threaded rod to pass through. The U brackets are lightly tightened lightly to hold the ringset where I want it as I solder it. I just tack it enough to cut the flare from the tail. 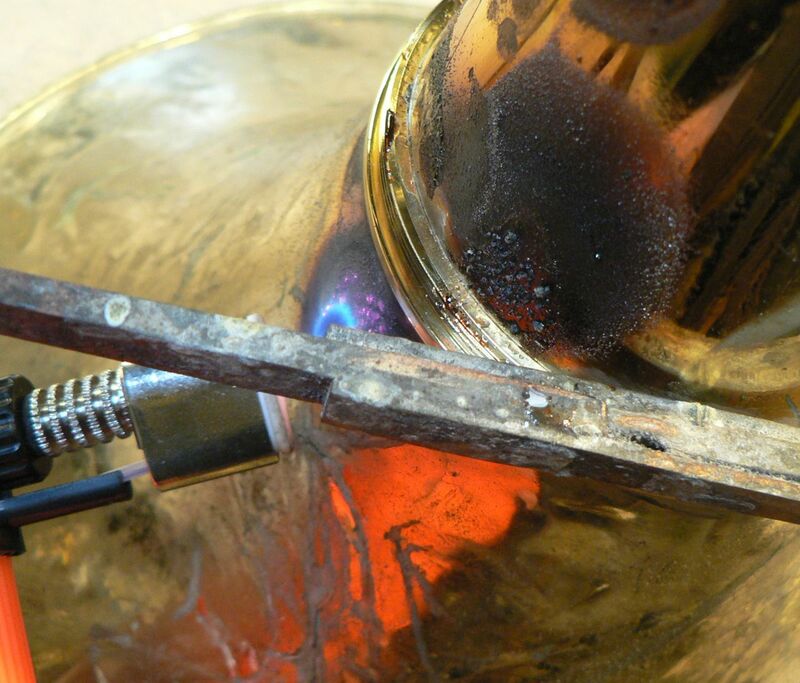 Note the lacquer burning as heat is applied during the tacking process. Once tacked, the high tec tool is removed and the flare and lower ring is cut from the tail. 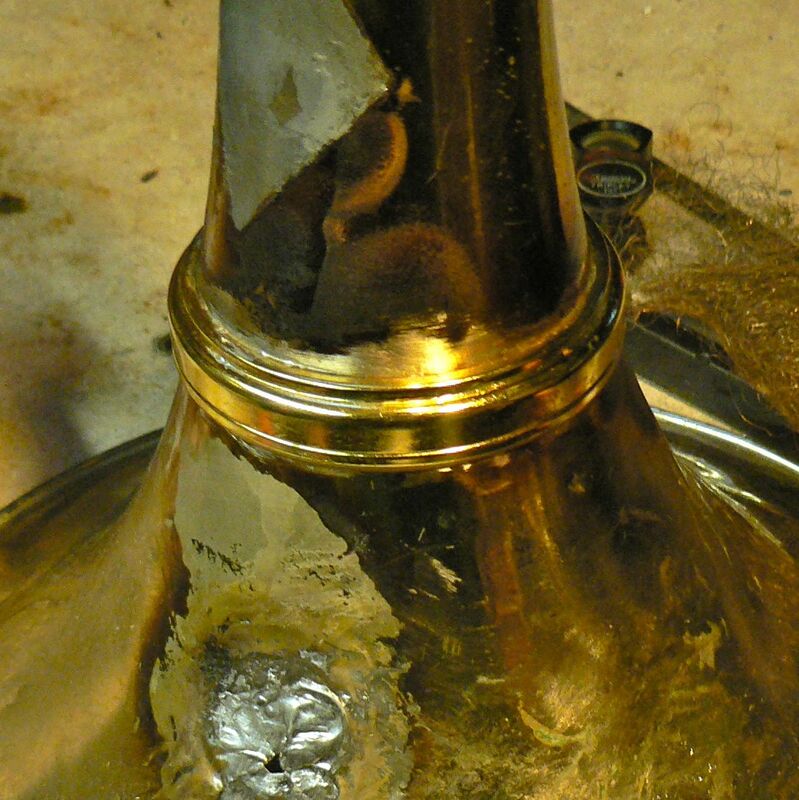 The next process it to attach the top of ring set to the bell tail. There are several different ways to do this, but because I’m using out of round parts from old used bell tails I need the mechanically hold the bell tail in place during the soldering. I put a shield over the lower ring set and then screw the top of the ringset, which has been placed over the bell tail, onto the bell flare. Note how high the bell tail brace is above the ringset. Also note that the top part of the ring set is not completely closed. This is the thickness of the shield. 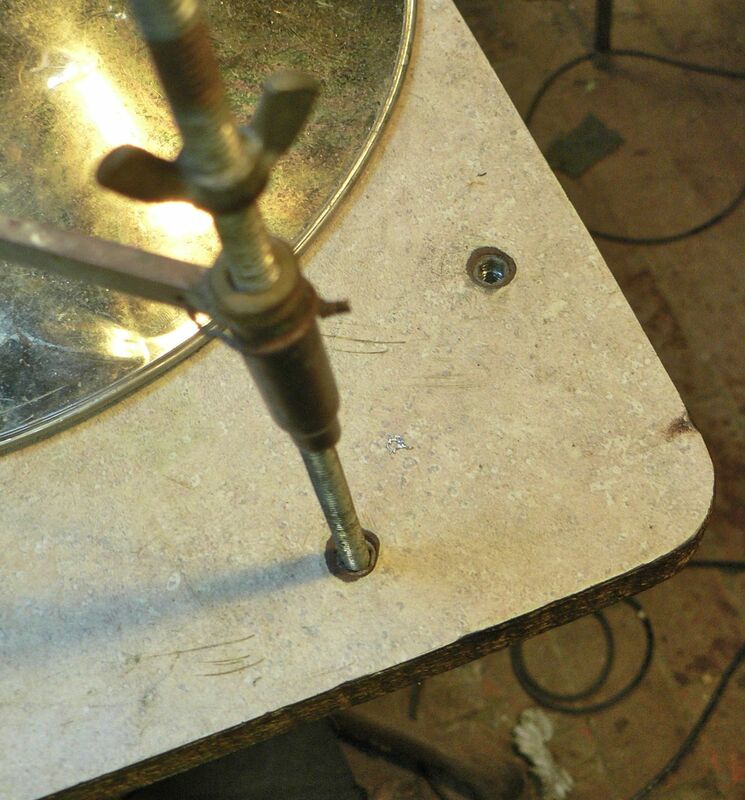 The shield keeps solder from working onto the lower part of the ring set. and soldering the top and bottom together. 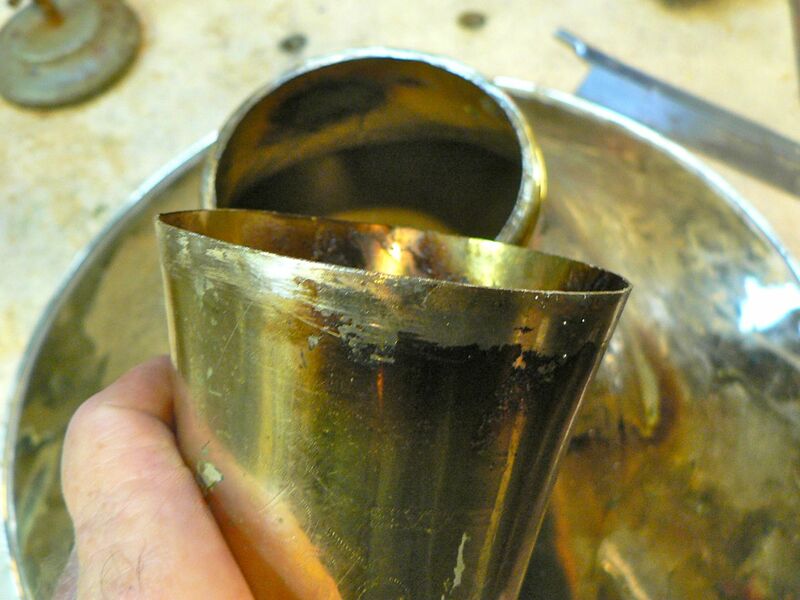 Most horn technicians have had to undo someone’s soldered together ringset, You see them on eBay, “the bell will not come off, but I sure it’s OK”….. More to come, Stripping at the wrong time of year…..Removing the crud oxide from within the horn’s valves and a-joining tubing. Perhaps lo-tech. 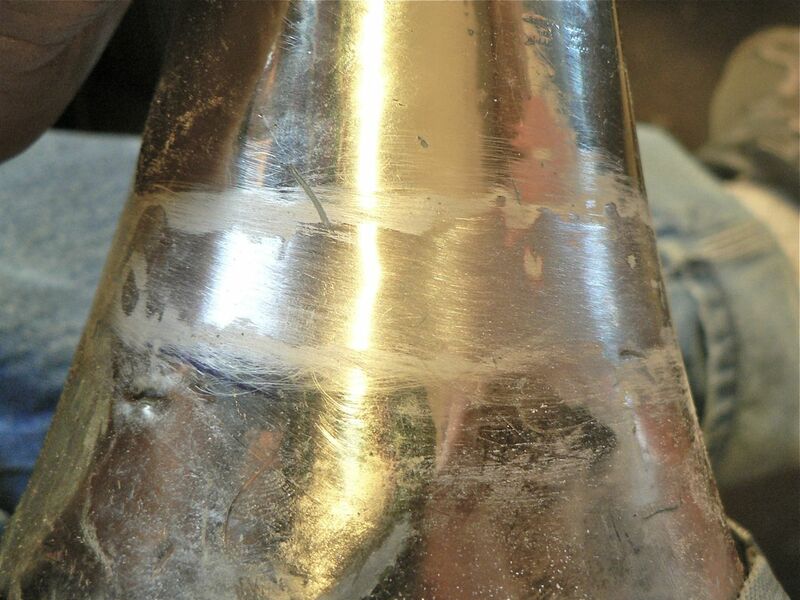 But if it works… Wouldn’t it be easier to strip using paint stripper rather then sanding the effected area? Reynolds laquer seems to come off easily. Unlike Yamaha and especially King horns. 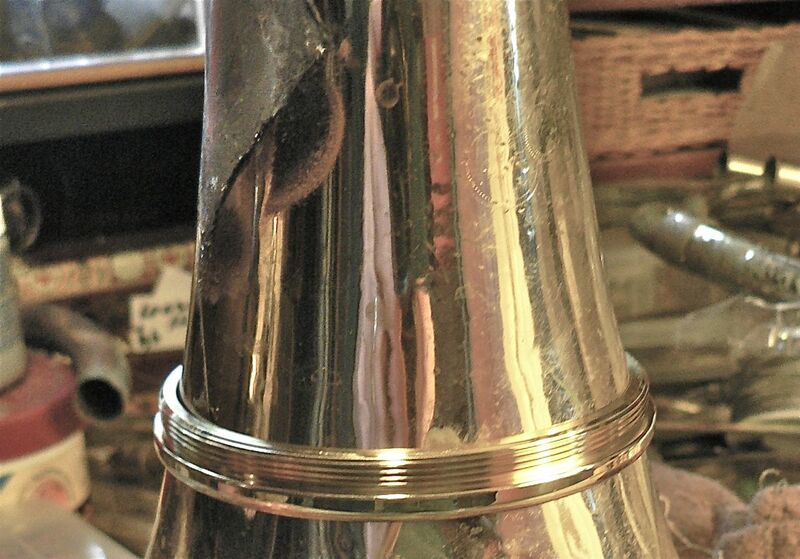 I’ve installed ring sets on new bells but never trashed used horns. It seems much more challenging to work on this kind of instrument. Also, I liked the recent entry on magnetic dent removal. I’ve heard about it but it’s never been demonstrated to me. Thanks. 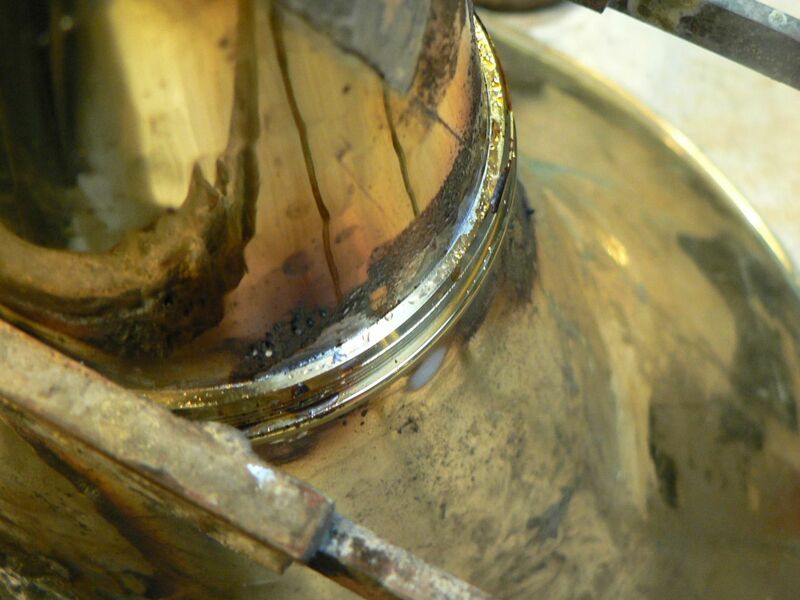 You are right and about the stripping, but I have scheduled another ‘stripping at the wrong time of year” blog to illustrate how heat makes lacquer stronger. Stay tuned, thanks for the comment. 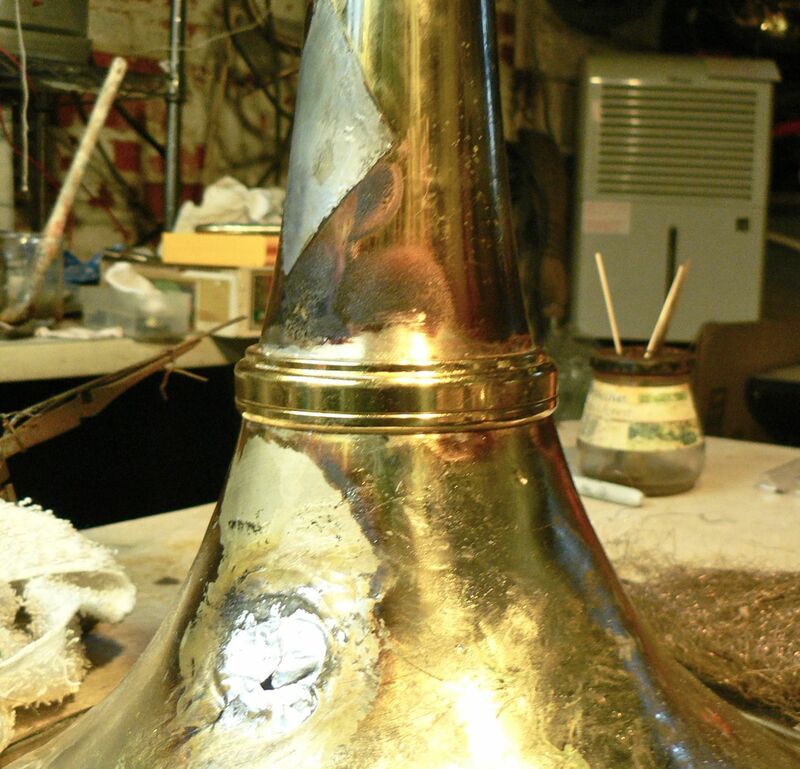 Sometimes you’ll need more than one horn to make one, trashed flares need a donor flare….the second horn. Ask questions, learn more.